Graffiti is not always referred to as art. Sometimes it is referred to as vandalism. This is because it involves the scrawling or painting of something on someone else's property. Namely, this pertains to buildings, but it could also include signs, billboards and even vehicles. Still, this mostly art form has existed since ancient times and continues to be a strong way for people to express themselves. The oldest form of modern day graffiti comes from Ancient Greece, and is thought to be an ad for prostitution. The ancient Romans and Egyptians also practiced graffiti on tombs, monoliths and other constructions. Mayans and Vikings also had graffiti art in their cultures. As time went on and passed into the Renaissance period, many famous artists emerged. Even those such as Donatello or Da Vinci would graffiti their names where they went. Graffiti continued in future cultures, with many invading armies painting or carving it in the walls of places they occupied. Modern graffiti artists have used the form to express themselves, their political or religious beliefs, or simply to make a mark. The United States is thought to be the home of the modern graffiti movement. It began in New York City in the 1970s and spread from there. Brazilians emulated this graffiti in their own work, which is thought to be some of the best in the world, with many powerful artists coming out of Sao Paolo in particular. In the Middle East, graffiti has a short history. It has been growing since the 1990s in Iran, Iraq and Israel. In particular, the Israeli West Bank wall has become a major site for graffiti. During ancient times, graffiti functioned as a simple way to alert people of the presence of underground areas or illegal activity. It was also used to mark religious symbols on holy places in a city. During the Renaissance and the years following, it was used as a sort of "I was here" marker for famous artists and invaders, and it was less of an art form. Modern graffiti is colorful, artful and often has a message behind it, which can be just about anything. Graffiti of the past was much simpler than modern graffiti. It did not use many colors and was often comprised of simple shapes, though one or may have been drawn into each other. Sometimes, the graffiti was simply a name. 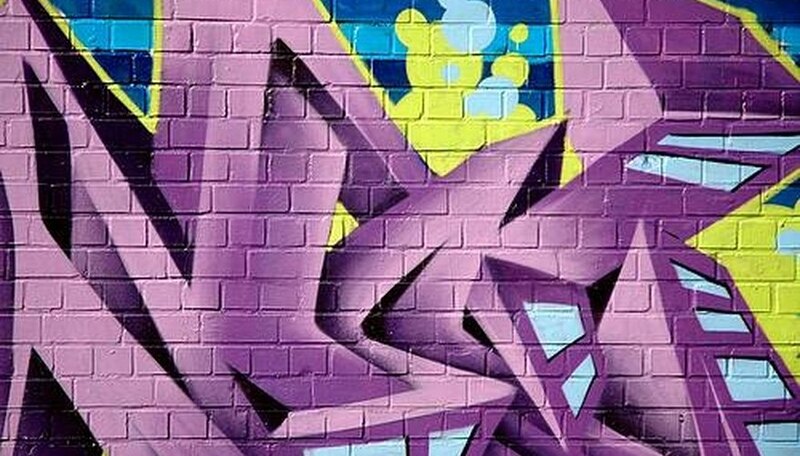 Modern graffiti may be only a name as well, or a code name for the arts (called a tag), but it often incorporates many colors and is larger than ancient graffiti. Still, in whatever form it comes, graffiti can be recognized as vandal art. The most recent history of graffiti has seen the art beginning to blend into pop culture and mainstream audiences. It is highly linked to hip hop cultures, as well as the "MTV culture" as some call it. In the late 1990s, graffiti has even been encouraged by some places, which may give artists a wall to paint on and practice their art. This shows that the future of graffiti art may lean less towards and vandalism and more towards artistic expression. However, this worries purists, since the definition of graffiti makes it an illegal art form.